Although Apple does not treat the keyboard in the late 2008 to mid-2012 MacBook Pros and 2008-2012 MacBook Airs as a service spare (they only supply it as part of the complete top case/unibody chassis), it can be replaced on it’s own with a little work. You have to remove pretty much everything from the laptop to get to it and there are over 50 tiny Philips #000 screws holding it in place, but it can certainly be worth the effort. This post is intended to avoid some of the common pitfalls in replacing the keyboard and in particular, handling it and connecting it back up to the logic board. It is not a guide on how to take the laptop apart. Although it is still possible to replace the keyboards on later Retina models, it is much harder since Apple started using tiny rivets instead of screws to fix the keyboard into the unibody chassis. Once you have removed all parts needed to get clear access to the keyboard (battery, fans, logic board, optical drive, hard drive etc. – See appropriate iFixit guide), carefully peel off the backlight sheet by working round the edges avoiding tearing the black backing sheet. 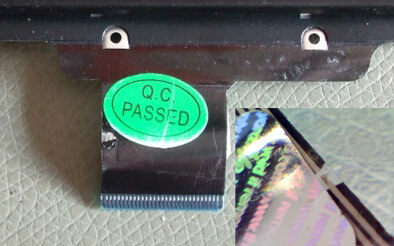 If you are replacing the backlight sheet as well, you don’t have to worry about damming the old one. The backlight sheet consists of three layers : a thin plastic mask, a clear plastic diffuser and a thin plastic backing sheet containing the backlight LEDs themselves, which is white on the front and black on the back. Try and remove the three together so they stay attached to each other as this avoids the need to align them later. Once removed, store it in a clean bag or clean location so that the adhesive round the edge of the backing sheet stays sticky which will help when re-attaching. Make sure you have a really good, sharp, #000 phillips screwdriver to remove all the tiny screws holding the keyboard in. Don’t bodge it with the wrong tool because if you strip one of those tiny screw heads, you’re in trouble. Once removed, fitting the replacement keyboard in place is a pretty straight forward reverse process. When replacing the backlight sheet, make sure the little block LEDs on the backing sheet are properly located in the holes in the diffuser sheet. If they are not then the backlight will not work. 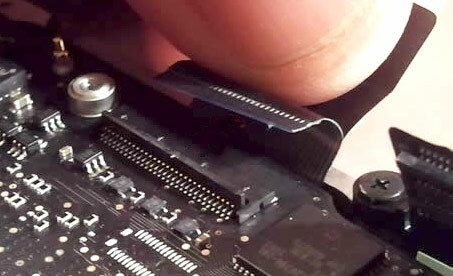 After re-fitting the logic board, you need to connect the keyboard’s flex cable to the socket on the logic board which sounds simple but there are a surprising number of things that can go wrong here. Firstly, the logic board socket has a thin plastic clamping bar along the rear edge which if you have never done this before, you might not realise is there. This needs to be lifted before you can insert the flex cable. This bar is very delicate and becomes more fragile with age. If it breaks, you have a big problem as it can’t be fixed, the keyboard won’t work without it, and to replace the socket means replacing the logic board unless you are a dab hand at surface mount reworking. Our advise is don’t use any tool to lift the bar as this puts all the pressure applied on a tiny spot along the clamp bar. Using your finger nail works well or even the nails of two fingers so you can spread the load needed to lift the bar along the length of it. When lifted, the bar should flip up and sit vertically as shown above. Next, check the state of the end of the flex cable. It is quite common for the end of the flex cable to become dog-eared during storage or handling. 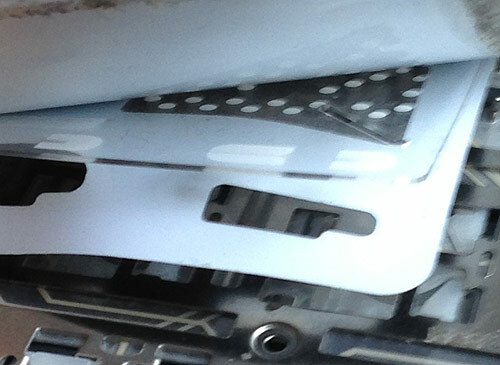 Make sure that the corners of the flex cable are not curled up or folded over at all. 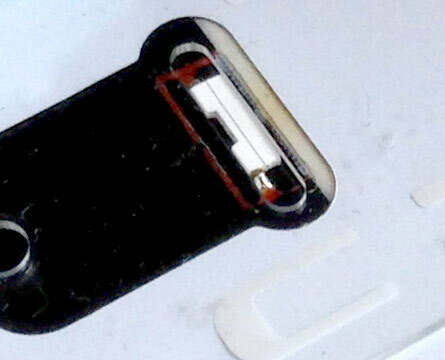 There should be a clear blue plastic strip along the rear edge of the flex cable (above left) which is essential to give the flex the correct thickness to be clamped securely by the socket. Ensure this blue strip is in place and not curled up. The electrical contacts along the front edge of the flex (above right) can easily be covered with grease or dirt from handling so if in doubt, gently wipe the contacts with IPA (isopropyl alcohol). These contacts are printed onto the plastic surface and can be wiped off if cleaned roughly so be very gentle. Once the flex is inserted as far as it will go and is sitting straight, push the clamping bar down but again, don’t use a tool for this; gently push it down along it’s length with your finger. Lastly, remember to re-connect the tiny orange flex from the backlight sheet to the logic board as this is easily forgotten. Hopefully these tips will help you avoid some painful mistakes and if you need any parts or tools for your repair, scoot on over to The Bookyard.